← 100 Jew leaders: Linda Sarsour is kosher! 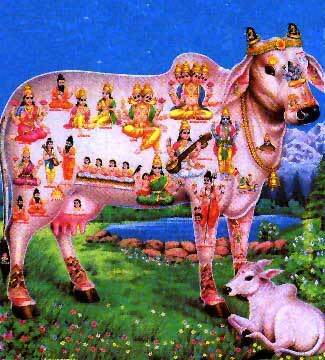 Holy Cow to become India’s ‘National Animal’! On Wednesday, Rajasthan (India) single-judge High Court Justice Mahesh Chand Sharma, who retired the same day, ruled that cow should be declared India’s national animal and anyone who slaughter or eat beef should be thrown in jail. In response to this Hindu food fascism, Thrithala MLA VT Balram announced that he has decided to start eating beef after 19 years. “I have been living without eating meat, fish or eggs since 1998. But now the time has come break it and uphold the right politics of food assertively,” Balram said, while posting a video of him eating beef with friends and fellow party workers. The ruling BJP believes that cows should be protected, because they are considered holy by India’s majority Hindu population. Some 18 Indian states have already banned slaughter of cattle. Ironically, India exports around US$5 billion worth of beef and buffalo meat annually, accounting for around 20pc of global ‘beef’ exports. India is also the second-largest exporter (here). India will also lose US$13 billion in global leather market. The Dalit (untouchable Hindus), Muslims, Christians, Sikhs and Adivasi (tribal people) which make more than 45% on India’s 1.2 billion population – mostly consume meat. According to some Hindu sources, India’s first prime minister and father of prime minister Indira Gandhi and grandfather of prime minister Rajiv Gandhi, Jawaharlal Nehru, a Kashmiri Brahmin, was a beef eater. India’s prime minister Morarji Desai had admitted in an interview that he drank a pint of his own urine each day. Hindu historian D.N. Jha, retired professor form Delhi University has claimed that Hindu scriptures never banned eating beef and many of earlier Hindu religious leaders consumed beef and other meat products. “There is substantial evidence in ancient Indian texts which testify to the prevalence of the practice of beef eating for many centuries in ancient India. The practice gradually disappeared in those regions, which are now called the “cow belt.” But it has continued in many other parts of the country, especially Kerala and north eastern states. In Kerala, 72 communities eat beef and many of them are Hindus. So, I would not say that beef eating is incompatible with Hinduism. But, at the same time there are many Hindus who would not even touch beef or even meat or fish,” Jha said in an interview he gave to the Jewish Wall Street Journal in October 2015.